One of the most frequently asked questions I get when out and about is where can I put my BaleGrow bales? The simple answer is anywhere. You do want to keep a few things in mind, the most important being sunshine. To have a happy, healthy and productive garden, your bales will need 5 – 6 hours of sun per day. This is the minimum amount of sun that your plants need to grow. If you have the option of full sun, this is even better. Most vegetables grow best with plenty of sun. Full sun or part shade? Placing your garden in full sun, especially over the growing season (spring and summer in Melbourne), is a great for tomatoes, cucumber, lettuce, capsicums and many other varieties of vegetables. If you don’t have an area with full sun, don’t be discouraged. 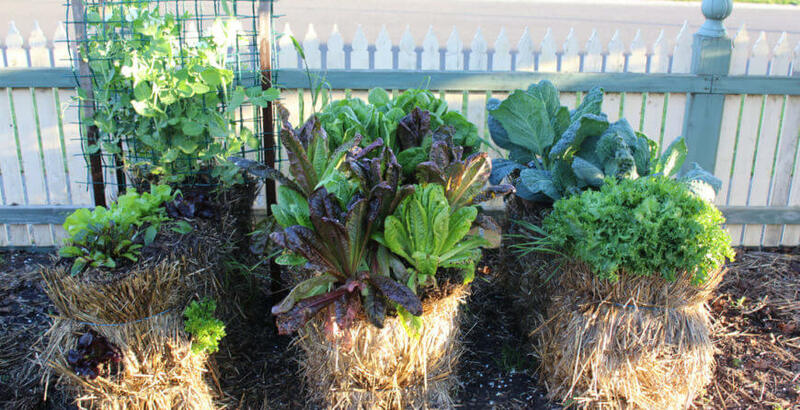 There are a variety of vegies that will still grow well in part shade such as beetroot, kale, carrots and leafy greens such as lettuce, endive and parsley. Just remember to keep your bales well-watered, especially if in full sun. This is, in my opinion, the biggest advantage to gardening in straw bales. Your bales can go anywhere. If there is sun, water and a space a little larger that a straw bale… your bales can go there. This means you can utilise any area in your front or back yard to be productive. So, if you are thinking I don’t have the space to have a veggie patch…think again!